The building has many period features including decorative stone window and door surrounds, hand painted tiles freezes to the front façade, Juliet balconies and mosaic flooring. The building has a footprint of 120sqm, and is set in a plot with 284 sqm. The building is in a good condition given it’s age, and had some work done recently, having a new bathroom and kitchen fitted in, though it still needs some decoration work to be carried out. The property has wooden framed windows and doors with some internal shutters. All the floors in the house are original, most of them in wood, only the bathrooms, dining room, the main entrance and the sun room have tilled floor, all in very good condition. Ground floor, the main entrance leads directly into a central hallway, to the right there is a good size double bedroom, and the wooden staircase to the first floor, to the left the first living room, that could also be used as a bedroom, and a storage room, in front the are double doors to the kitchen. The kitchen was recently fitted and includes a good range of built in wooden units with wood work surfaces. Of the kitchen there is a dining room that has a traditional fireplace, and access to a smaller room that could be used as a study or office space. Also from the kitchen there are double doors to the sun room from where you access the bathroom, this bathroom was fitted when the kitchen and has a big walk in shower, a sink, and toilet, it is fully tiled and it has the connections for the washing machine. From the sun room downstairs, there is access to the patio. First floor there are 3 bedrooms, one big bathroom, and a second living room with some original hand painted ‘landscape’ murals. All the bedrooms are very good size double bedrooms, there is one that does not have a window. The bathroom is very big and has a big corner bath with shower above, toilet, bidet and a wash basin with storage unit underneath . From this floor there is access to the attic space, this attic is big enough to be converted in to more accommodation if needed. The cottage is situated in the centre of the town of Sao Miguel do Rio Torto and is within walking distance of several cafes and mini-markets. The town of Sao Miguel do Rio Torto, is situated south of the River Tejo (Tagus) and is around 10 minutes drive from the larger town of Abrantes. Sao Miguel do Rio Torto is a sprawling town and has a good selection of cafes, bakeries, mini-markets, pharmacies, butchers, bars, school, health centre and social centre. Abrantes is around 10 minutes drive from the property and there is a larger selection of supermarkets, shops, cafes, bars, restaurants, schools, university, hospital, sports centres, river beach, discos, cinema, builders’ merchants and historic castle. 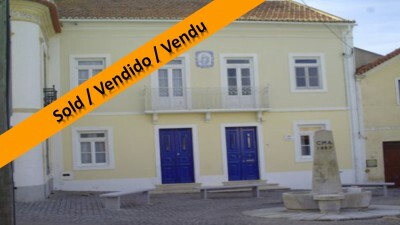 The property is easy to access and has good road links to Lisbon, via the A23 dual carriageway. Lisbon airport is around one and a quarter hours’ by car. Lisbon airport is serviced by a selection of low cost airlines, which operate regular flights into and out of the United Kingdom and other European countries.